When we think about a before-and-after picture, what comes to mind is most likely a pedicure transformation or a nail makeover. You can also practice a different, equally important type of before-and-after. When time allows, one of my favorite things to do with class attendees is have them make what I call a “benchmark” nail. This nail is done at the beginning of the class with no help from me at all. Then at the end of class, everyone has the chance to do another nail so they can see right then how much they’ve improved over the course of the class time. This is something you could do with your practice in the salon as well. 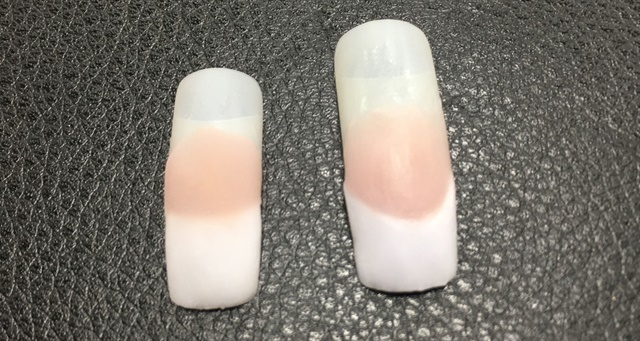 Take a photo of your first practice nail to compare to the last one at the end of a day, week, or month. Being able to see that your work is paying off makes it easier to keep at it. It also helps prevent you from being too hard on yourself for lack of instant perfection. Watching the progress is a reward unto itself!